It's the Snuffmeister here. I'm currently at work on a discussion of that sci-fi anime classic, The Super Dimension Fortress Macross. 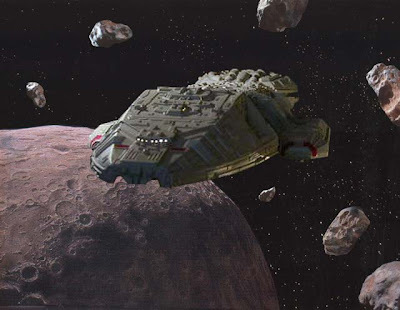 After Deej tortured us by making us watch the entire 1978 Battlestar Galactica, I couldn't help but notice some similarities between the two shows: both are about space-borne aircraft carriers fighting relentless alien assaults as they make their ways, along with a lot of civilian hangers-on, toward Earth. So it occurred to me to ask, if the SDF-1 Macross and the Battlestar Galactica battled each other, which would win? In the grand tradition of that great website Grudge-Match, we will now debate the issue and hand it to our readers to vote. I will of course argue for the Macross. Deej, the BSG fanboy, will argue for the Galactica. Deej, you're up first. D.G.D. : Thank you, Snuffles. 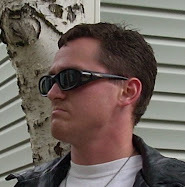 I look forward to kicking your @5$, and I look forward to seeing the Galactica kick the Macross's @5$. Let's begin with a discussion of armament. The Galactica, not being limited by such pesky things as physics, has an unknown number of highly maneuverable fighter craft, some of which are piloted by hot babes. It is also arrayed with numerous laser cannons designed to take on capital ships as well as eliminate enemy fighters. In addition to that, it has its powerful forward lasers, which can destroy an enemy capital ship or even cleanse an entire planet's atmosphere of nuclear missiles. On top of that, it has some missiles of its own, which, judging by the stock footage used during their launch, are rather potent. At least two of their pilots are both aces and protagonists, meaning they are unkillable. And Lorne Greene is at the battleship's helm. And the bridge has red lighting and moving parts, making it really cool and therefore harder to destroy. The Macross, on the other hand, thinks a bratty teen J-pop idol is a super weapon. Snuffles: Don't try to end your gibberish by changing the subject; we'll discuss Minmay later, if we can't avoid it. I contest your absurd claims that the Galactica has weapons superior to the Macross. The Macross, too, has an "unknown number"--an apparently limitless number--of fighter craft, but the Valkyrie fighters are not mere X-Wing knockoffs like the Galactica's Vipers. The Valkyries are not fighters only, but can transform into giant robots, because you simply can't have good anime without giant robots. The Macross also has on board an "unknown number" of vaguely anthropomorphic and heavily armed Destroid tanks, which can crawl on the outside of the Macross to repel enemy assaults. And as for your "forward lasers," it is to laugh. The Macross has its massive main cannon, which can take out numerous enemy capital ships at once. And did you say missiles? Missiles? You are perhaps forgetting what the Macross is famous for--that's right, I mean the Macross Missile Massacre! Every single one of the Macross's fighters carries something upwards of eight bajillion missiles, and at least five hundred of those get launched even in a typical attack on a fighter. You forget, too, that the Macross is not just a space ship: it's a transformer. The Macross itself can turn into a gigantic robot and launch its Daedalus Attack, in which it punches one arm into an enemy ship, opens a bay, and fires off enough missiles to riddle the entire enemy ship from the inside! D.G.D. : You're getting over-excited, Snuffles. I'm sorry, but your missiles are simply no threat. As I already pointed out, the Galactica can cleanse an entire planet, in a sanitary and environmentally friendly way, of its missiles. Do you think it can't cleanse the air, or the vacuum, of your so-called missile massacre? The Macross's fighters will find their favorite weapon useless, rendering them vulnerable to the laser blasts of the Galactica and its Vipers. Snuffles: The Macross is, I admit, vulnerable to lasers. However, with its point defense system, an impenetrable but limited force field, it can stop most incoming laser blasts or projectile weapons and prevent major damage. It is even capable of generating a fully encompassing force field for a limited time. The Galactica has no force field at all. It is vulnerable not only to fighter assaults but to the Macross's main gun as well, which could take it out in a single blast. You will notice, too, that the crew of the Macross is not stingy in the use of this cannon, whereas the Galactica's big lasers get used about twice in the entire series. D.G.D. : The Galactica uses its big weapons when it needs to, because its commander is wise and judicious. The Macross is infamous for its weapon wastefulness. Snuffles: Ha! That's because the Macross can never run out of weapons! May I remind you, the Macross has infinite supplies. In fact, the Macross more-or-less defines the concept of Infinite Supplies. That means that no matter how many assaults the Galactica launches, the Macross will still have another fleet of transforming Valkyrie battroids, another platoon of Destroid tanks, and more missiles. On top of that, the Macross can never run out of the abundant food and toys for the 60,000+ people living in decadent luxury in its cargo bay. The Macross can do it all, and in a single ship! By contrast, the Galactica has to drag along a ragtag fugitive fleet where most of the people live in boxcars. D.G.D. : Most of the people in the Fleet might live in boxcars, but there's still plenty of decadent luxury for the Galactica characters who count. But never mind that--the real issue is military capability, and the Galactica's supply of fighters is every bit as limitless as the Macross's. Snuffles: But there's another factor you're forgetting--engineering. The civilians and military personnel of the Macross managed to put together an entire city inside their ship, gleaming and beautiful with good sanitation and uncongested streets, and they built it in the space of two weeks. That city gets destroyed something like four or five times in the course of the show, and it is always shiny and new again by the next episode. And don't forget that they built the entire city out of junk floating in space! These people are friggin' geniuses. There is nothing the Galactica can do to the Macross that the Macross can't have repaired in a day. On the other hand, the Galactica crew had to spend an entire episode fighting a fire that threatened to destroy the ship. One fighter exploding in the landing bay or near the bridge and the Galactica is potentially finished. Snuffles: Hold on, I wasn't finished dismantling your dumb arguments yet. You mention Lorne Greene, and I'm sure he's cool and all, but Captain Global (or Gloval, or however you want to spell it) is pretty cool himself, especially when he does that one-visible-eye-under-his-hat shtick. Also, you discuss the Galactica's cool bridge. Now, admittedly, the Galactica does have a pretty cool bridge, but the Macross, you will note, has the original Bridge Bunnies. D.G.D. : Wait a minute, are you claiming that a bridge crew made up of giggly schoolgirls trumps cool moving parts? D.G.D. : That's crazy. While the bridge crew of the Galactica is on the ball and dealing with the battle, the bridge crew of the Macross will probably be in town looking for guys to take them to the disco. Speaking of which, notice that the Galactica has special vehicles to move pilots rapidly to their fighters, meaning the Galactica can deploy its fighters quickly. But on the Macross, the pilots, who spend most of their time wandering around town, have to hail a taxi. The Vipers will have already devastated most of the Macross by the time the Valkyries manage to launch. Furthermore, Hikaru, or Rick Hunter, or whatever his name is, does something in just about every episode that could get him court-marshaled, yet he never gets in trouble. This is all evidence of lax military discipline. Snuffles: Hikaru's questionable actions are nothing compared to Starbuck's, so don't even start. The Macross has enough discipline to ward off countless Zentradi attacks, so I'd say they're doing fine. 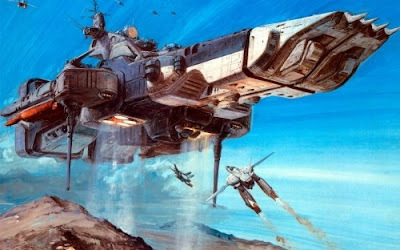 In fact, if you can judge a ship by its enemies, I'd say the Macross has held off more formidable foes than the Galactica--the Zentradi are fifty-foot giants who know only war and have millions of ships and the capacity to wipe out entire planets. But the Cylons are jerky robots who drop like flies in every battle. D.G.D. : Excuse me, are we talking about the same Zentradi who thought a girl in a swimsuit was a secret weapon? The Zentradi who were paralyzed by the sight of Hikaru and Misa sucking face? The Zentradi who thought a Kung fu movie was evidence that humans possess superpowers? The Zentradi who lost the will to fight because the Macross was broadcasting J-pop music? (Admittedly, I have a similar reaction to J-pop.) The Cylons also destroy whole planets yet show a curious inability to take out one battleship, but for all their faults, at least the Cylons are not distracted and demoralized by attractive women; we know this for a fact, because if they were, the female cast of Battlestar Galactica would have devastated them instantly. You can keep your pouty J-pop idols and bubbleheaded bridge crew: we have Laurette Spang, Maren Jensen, and Anne Lockhart, any one of whom could destroy the entire Zentradi fleet single-handedly by batting her eyelashes. I note that the Zentradi are even more freaked out by the sight of children than they are by the sight of women; witness, therefore, the awesome power of Boxey, his robotic dog, and all the kids who show up as extras. Battlestar Galactica beats Macross on both the Babe Factor and the cuteness factor, even though Macross is an anime. Snuffles: Ha! But everyone knows Boxey and his dog are annoying! D.G.D. : Everyone also knows Minmay is annoying. Snuffles: Curses! Very well, the Galactica has Babe Factor...but wouldn't you agree that Babe Factor has now been permanently ruined...by Tricia Helfer? D.G.D. : Aaaaarrrgghhh!!! Never say that name in my presence!! Just you wait until Warner Bros. comes out with that live-action Robotech movie, and then I shall have my revenge!